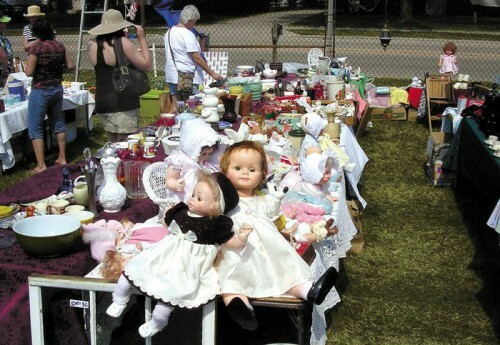 It’s less than a month until the next Elkhorn flea market rolls around. We’re planning on renting a booth and selling our wares there in the September 30th event, but if you’re in eastern Wisconsin on the 12th of August you should stop at Elkhorn and see what’s shaking. The photo above comes from a recent newspaper article about the flea market, including an interview with Nona. She runs the sale with her husband, Skip, who runs a antique shop in Hales Corners that Wifey and I frequent from time to time. The pictures don’t do the sale justice — it’s a lot more than nutcrackers and dolls, and more high-end antiques than rummage-sale stuff. One Response to "Elkhorn Coming Up"